Slow Susan was always getting distracted. At the office, she'd get up to use the printer and she wouldn't be back at her desk for an hour and a half. It wasn't that she was lazy, it's just that she took her time. She talked to people on the way there. Once her sheet printed she dallied with the printer settings to see if she could find a better setting. Then she'd find herself wandering outside after someone told her the sun was out. She might get locked out of the work building and take the long way round to the front entrance. Usually, Susan got away with her laidback pace but some days, her coworkers got on her case. The thing is, Susan couldn't help it. Slow was in her nature. Perhaps it would have helped to have a mask that let everyone know what she was at heart! 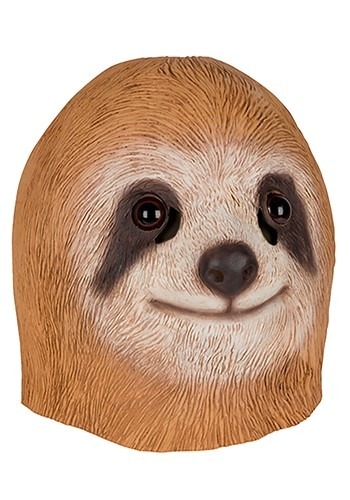 This molded latex mask is a detailed representation of a sloth. It covers the entire head and has a slight smile. The shining bright button eyes stand out in the sweet sloth mask they are right beside the eye openings for limited vision. With a flexible material, you can easily store this mask away for next year's Halloween or the for when you're feeling just a little slow.